The Wits Tang Soo Do club has returned to South Africa from the World Championships in London with a total of 31 medals, including 14 gold. The team of nine members participated in the competition which took place on August 4 and 5. “The competition was fierce,” said Daniel Chen, second-year mechanical engineering student, who won three gold medals and a bronze. Chen is a newcomer to the Wits club and London was his first international competition. Second-year computer sciences student, Jichandre Sambo, was overjoyed with his haul of two gold and two silver medals, one in each of the four categories in which he participated. “It was amazing. Going there I had the mentality of making friends and colleagues proud,” Sambo said. “We ended up with two world champs in the black belt division,” said Wits coach, Master Gregory Hart, who says he could not have asked for more from his students. Hart told Wits Vuvuzela that the team has been working really hard for the past year and their hard work has paid off. Ngwato Kekana, a Wits architecture alumnus, was participating for the second and final time in the world championship as part of the Wits club. Kekana won medals in all three categories he participated in. “They are practicing really hard, they don’t hold back – it’s really inspiring,” he said, speaking about his competition at the championships. 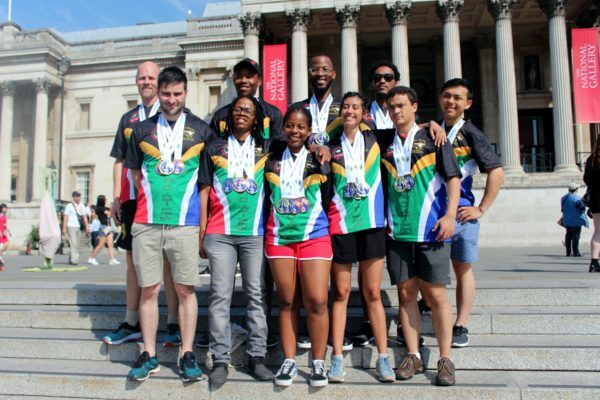 The South African 55-member team, including participants and instructors, won a total of 113 medals at the championships which attracted 700 competitors. Left to right front: Wesley Baleta, Ngwato Kekana, Makgabo Mahopo, Tanita Ramburuth-Hurt, Kim Lucas. Left to right back: Master Hart, Refilwe Gomba, Titus Masike, Jichandre Sambo and Daniel Chen. The Wits Tang Soo Do team on the National Gallery Steps in Trafalgar Square, London. Photo: Provided.